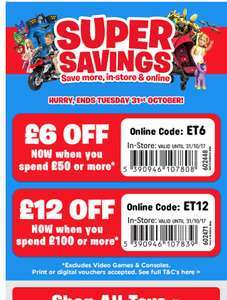 Smyths toy shop currently have offer of £6 off £50 or £12 off £100 across all toys. The last few years i have been given vouchers by smyths in the post of £5-6 off of £15 so this is not that great a deal to me. i guess if you are going to spend £100 its a fairly good deal but otherwise id leave it.